Clean Water Systems & Stores Inc was chosen to design and supply an advanced automated chlorine disinfection skid for a potable water storage tank at the Opal Gas Processing Plant in Lincoln County Wyoming. The Willliams Companies Inc owns and operates the Opal Gas Processing Plant in Lincoln County, Wyoming. The plant processes natural gas gathered from wells in the area in preparation for interstate natural gas pipeline transport. It also produces natural gas liquids (NGLs) from the natural gas. The Opal plant initially began operations in 1958, and in recent decades has undergone significant expansions to serve growing natural gas production in Wyoming. The plant currently has approximately 40 employees. A new administrative building was recently built and is supported by a storage tank with trucked-in treated water. Water demand at the site is not large and the water is often stored for long periods. During this time, the chlorine residual would drop below the requirements of the Wyoming Department of Environmental Quality. The state agency asked the company to install an on-demand chlorination system in to order to make sure the water in the storage tank was kept sanitized and a steady chlorine residual maintained. 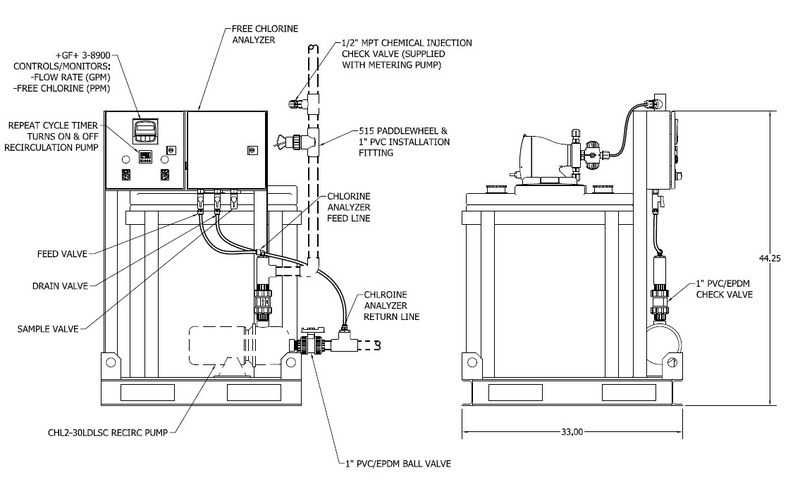 Clean Water Systems was chosen to design and supply a package skid recirculation and chlorine injection. Clean Water Systems specializes in turn-key package disinfection systems for ground and surface waters. 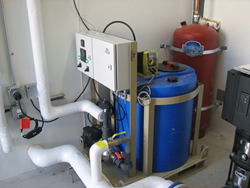 Common packages include automatic chlorination, ozone, and UV sterilizer systems. To satisfy the Wyoming DEQ requirements, an automatic chlorination system with recirculation pump was designed. The recirculation system is turned on and off by a repeat cycle timer. The skid has a 1-1/2 HP stainless steel recirculation pump pulls water from the storage tank and pumps it through a GF 3-8900 chlorine analyzer. Free chlorine is regularly monitored automatically, and if the free-chlorine residual drops below 0.25 PPM, the metering pump turns on and injects sodium hypochlorite solution, and boosts the chlorine residual back up to the desired level. A paddle-wheel flow-sensor senses flow and activates the metering pump to turn on and inject chlorine when the water is flowing. The system features a double-wall tank for extra protection and is all mounted on a heavy powder-coat steel frame and skid. A technician from Clean Water Systems, Demian Ashley was sent to the site to start up the system and review the operations with the on-site staff from Williams Company, and the installers Envision Mechanical. “Their technical staff and the staff from Envision Mechanical did a great job of installing not only the chlorination skid, but also the shed where the equipment was located. It featured a chlorine gas detector and was completely winterized. Looked very good, and the system is operating perfectly”. Clean Water Systems & Stores specializes in water treatment for contaminated ground and surface waters, and has over 17,000 customers in more than 40 countries. The company provides custom easy-to-install water treatment systems and products in a large variety of different types and configurations including systems for removing iron, manganese, sand, odors, bacteria, turbidity and sediment. The company also designs custom commercial and industrial reverse osmosis and ultra-filtration systems that are manufactured in the U.S. for bottling water plants and commercial applications.